This certification series provides the proven strategies you need when you are selling to multiple decision makers in a business-to-business environment. You want to minimize your sales cycle by knowing which prospects to focus on so you avoid wasting your time on prospects who have little probability of buying from you. You want to maximize your selling time by knowing how to prioritize your business and allocate your selling time. You want to be able to distinguish yourself from the competition and be clear that you can move the buyer from interest to buying as you manage your sales process. You will acquire the skills you need to quickly learn to fit your products or services as the solution to your prospects’ wants or needs. With multiple decision makers you will learn strategies to identify supporters and neutralize your opponents. This program is organized into strategic planning tasks you will complete to manage your sales business as well as preparation to work with prospects before, during and after the sales call. When you achieve this certification you will benefit with the skills and strategies to organize your sales territory, prioritize customers, leverage technology and sell successfully. 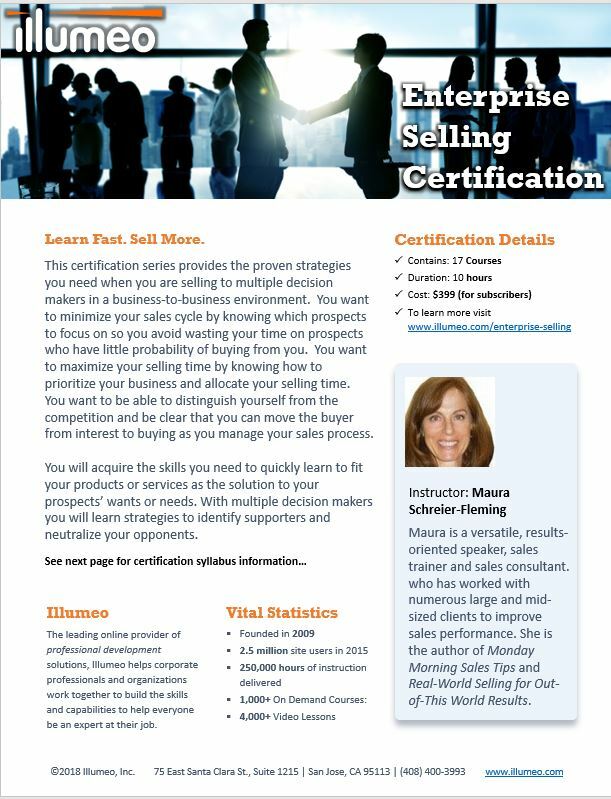 The courses in this certificate program are taught by an award winning sales expert with decades of successful enterprise sales and selling experience. Maura Schreier-Fleming founded Best@Selling in 1997. Maura is a versatile, results-oriented speaker, sales trainer and sales consultant who has worked with numerous large and mid-sized clients to improve sales performance. She is the author of Monday Morning Sales Tips and Real-World Selling for Out-of-This World Results. Maura works with business and sales professionals who want to get better results from their work. Maura contributes her sales expertise so clients can shorten sales cycles, increase profits, and increase productivity. She is a sales expert with Allbusiness.com and writes a sales blog for sales professionals. Allbusiness.com has over 600,000 readers each month who are looking for new ideas to sell more now. Maura’s presentations focus on the skills and strategies that improve sales, teamwork and management. Her clients enjoy her approach that makes learning practical and effective. She identifies sales strengths and gaps and implements solutions for improving sales performance through specific sales training. She has considerable experience with selling and the sales process having spent over 20 years in the oil business. Her customers included Bell Helicopter, Northeast Utilities, Georgetown Steel, Stanley Works, General Tire and other commercial customers. She sold over $9 million of industrial lubricants her last year in the oil business. As a sales catalyst, Maura has designed and developed many highly effective training courses and brings a broad base of experience to her clients and sales consulting. Clients include the Houston Texans, Chevron, Ebby, JCPenney, the New York Press Association and others. This course highlights some of the key decisions that sales professionals should make to enhance their sales productivity. This course focuses on your selling strategy, which begins before you contact a prospect. This course helps you learn your sources of value so your prospects are willing to pay more for your products and services. This course teaches the components of your sales process in Selling Strategy. This course explains how to overcome the challenges of selling on the telephone. This course explores the foundation of selling, which includes creating and maintaining rapport. This course teaches you to ask questions that result in productive sales calls that motivate customers to buy from you. This course explores the listening skill set that is critical for sales and business success. This course explores persuasion strategies that help your customers make buying decisions. This course teaches you how to prepare for a negotiation so you have more options as you negotiate. This course explores which questions to prepare so you are more likely to sell. This course teaches how to get fewer objections and shorten your sales cycle when you apply the strategies in this webinar to your selling. This course explains how to create and deliver more effective sales presentations when you apply these strategies. This course teaches strategies to create satisfied customers who avoid buyer’s remorse. This course teaches how to avoid the drawbacks inherent in communicating via email. This course teaches how to demonstrate value to customers and prospects which will help you reduce your sales cycle and sell more. This course teaches how to write testimonial letters that are useful for selling and that prove the claims you make to prospects.